The topic of war is not an uncommon theme in Australian theatre and, with the ANZAC centenary approaching in 2015, it seems particularly pertinent. Whilst much of the creative dialogue around the First World War focuses on the men fighting at the front, improvised Canberra production, The Home Front, focuses on the women left behind to hold the fort. Produced by Heidi Silberman and Catherine Crowley, and directed by Silberman, this brand new piece of improvised theatre explores the lives of three women living in Australia during the First World War. The three women, played by Catherine Crowley, Ruth Pieloor and Lynn Petersen, make up nearly the entire cast of this production, with the audience making up the final element of the story. Typical of improvised theatre, the characters played Crowley, Pieloor and Peterson, and their circumstances, are set to change depending on what the audience chooses, with Director Heidi Silberman there to help guide them. I caught up with Catherine Crowley to discuss the production. The idea for the The Home Front was initially conceived when Crowley’s Grandma passed away and she started digging into her family history. After fruitlessly hunting through council records, Crowley gathered her mother and aunty together in the same room and the three of them sat down and let the memories flow. This got Crowley thinking- everyone knows the story of the ANZAC’s but who were the women who lived through the First World War? What were their lives like? To answer these questions she conducted months of research, looking through archived letters at the National War Memorial and National Library here in Canberra, fossicking through council records and breathing life into the serious and straight-backed women we often see in old photographs. Keen to show these women and their lives to an audience, Crowley approached Heidi Silberman in early 2013 with her idea to create a piece of improvised theatre and Silberman immediately agreed to direct. Now, after a year of hard work and “an amazing experience” participating The Street Theatre’s The Hive program, The Home Front is set to transport audiences into a little remembered aspect of an important time in Australia’s history. Crowley’s research, and the cast and director’s work with vocal dramaturg Dianna Nixon, were instrumental in the devising process of The Home Front. As improvised theatre doesn’t have a script, and characters and stories are dictated by the audience; the cast focused on learning as much as they could about the era and about the women- how they spoke, how they interacted with one another, and even how they would have expressed emotions. “One of the most surprising things I learned about these women was the extent of their resilience, they got on with their lives but it was a fine line because no matter how tough they were, they were still operating under the heavy weight of war, and this would have affected their relationships with their friends and community”. In keeping with the quest for authenticity, The Home Front boasts an ambitious set and costumes specifically designed by Imogen Keen, and lighting design by PJ Williams. Crowley and the cast also deeply explored various female archetypes, and techniques to raise the tension and push the dramatic stakes. “There are lots of possibilities, lots of particular kinds of stories that can be related to particular kinds of characters…The beauty of improv [sic] is that it’s all in the moment, it can be much more authentic and you have to rely on the relationships you have as actors…trusting the rest of the cast will support everything you do, and vice versa”. “After an improvised performance, people will often find that things linger…emotions are felt more and that’s what this play is about. It’s about showing people who these women were and hoping the audience will see a bit of themselves in them, maybe even learn something from them…it’s worrying that we don’t look back at our history and learn from it”. With the eventual goal of one day touring the production around regional Australia, where it is predicted to be keenly felt, Catherine reflects on the importance of sharing these lesser known experiences of the First World War. “With absolute respect to the diggers, it’s important these stories are told because these women were fighting their own battles, and it’s also important to recognize this was a period of important change for women, particularly in regards to their independence and social mobility”. 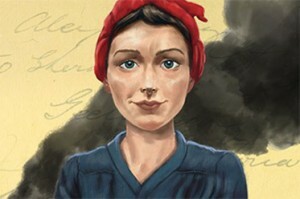 The Home Front is showing at The Street Theatre in Canberra from 18- 28 June. This entry was posted in Arts, news, Theatre and tagged canberra, emancipation, improvised theatre, the home front, The Street Theatre, theatre, women, World War 1. Bookmark the permalink.